We rent our flat in Venice for short weekly stays all year round (preferably weekly stays but we can accept a minimum stay of three days). The flat is perfect for two and suitable for a family with a child. “Nati’s House” offers the comfort and the charm that could emphasize the value of your stay in this spectacular city of the world. Very well lighted, it faces with a balcony a marvellous typical Venetian canal, in a part of Venice, which still belongs to Venetians. We think this is a great value for the wise tourist. The double bed is equipped with orthopedic mattresses (we have recently replaced the old bed following clients' suggestions). The flat is completely furnished, some pieces of furniture are antique and it is located at the first floor: safe when the sea floods the streets and far from humidity of the ground floors. “Nati’s House” is waiting you just four minutes by the Alilaguna water bus stop (shuttle service from/to the airport). Without otherwise agreed, keys are delivered directly to your contractual address by post. So at your arrival, you will already have the keys and detailed directions. We manage also some other beautiful accommodations in Italy (also in Home away websites): not only in Venice with 'Nati's House' (#8044) but also in Florence 'Magenta apartment' (#6903624) and 'Renzo's Apartment' (#6913296), in Bologna ‘Ca’ di Vale’ (#885480), in Apulia a trullo with swimming pool (#81166). Visit on Home Away all our properties using the given codes or ask us the web site link. It is worth doing it: just a click! Owner: Paolo Devescovi, owner since 2003, architect free lance and art teacher in public school. In early 2002 the stock exchange crisis caused by the disaster of the twin towers, spread over the world. In that occasion I saw my savings eroded considerably. So I decided to buy a little flat in Venice (Nati's House). I am an architect and surely I can take care of buildings better than care of money. Since then, the rental activity, held through the web, became an important activity of mine. As freelance architect I soon acquired clients who expressly wanted to restore or to refurbish their houses for doing the same rental activity I was managing for my new Venetian place. The whole has been dressed by my enthusiastic approach to the possibilities offered by the Internet. I aggregated around my private website a small community of guests. In some cases, true friendships started for long lasting rapports. Since then, the rental activity, held through the web, became an important activity of mine. As freelance architect I soon acquired clients who wanted to restore or to refurbish their houses for doing the same rental activity I was managing for my own properties. The whole has been dressed by my enthusiastic approach to the possibilities offered by the Internet. I aggregated around my private website a small community of guests. In some cases, true friendships started for long lasting rapports. Some years ago, some companies bought the whole trust of the online advertisements, beginning to target the fast online-booking-style through the search engines rather than to foster the quality of growing sincere relationships as I was used to offer through my website and my personal brand. Anyway I go to great lengths to maintain the original spirit and fight against standardization of great commercial websites. Right now I can count to the cooperation of my valid colleague and architect Carlotta Lo Verde. On one thing I staid strong: I maintained the same prices in all my advertisements.. This reduction takes into account the fact you have to pay an 8.7% average rate as Service Fee to book through this website (actually the total will grow as you proceed with the checkout procedure!). The price, based on short stays, you are going to pay using this website, is approximately the same you can find in my private website or in other websites advertising my property. Differences may persist, but, positive or negative they are really inconsistent (a few euros due to the VAT policies, variability of currency rates and other factors). If you book through this website you will get the benefit of an insurance and my advertisement will rank into a higher position toward the top of the ‘anonymous competitors list’ of this website. You will find everything you need to rest after your Venetian hard walks and to prepare a wonderful Italian dinner with Paolo's original recipes. 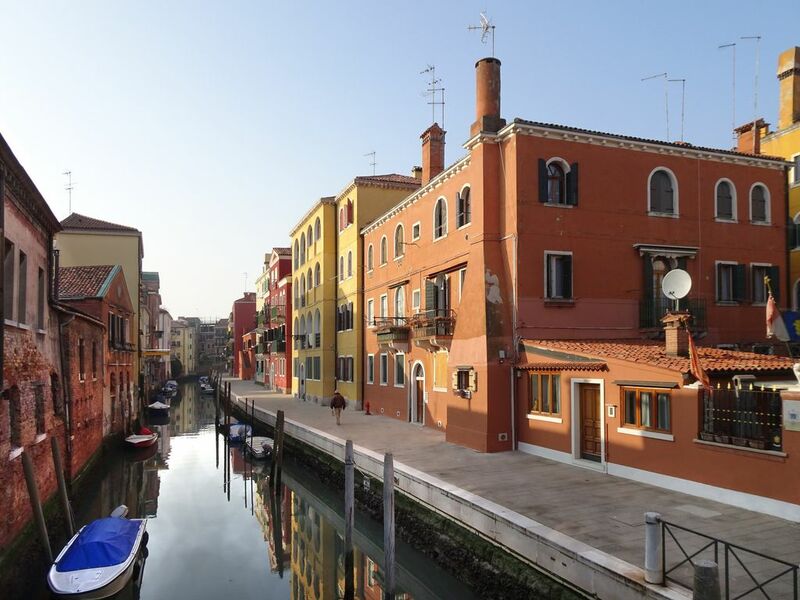 We spent a week in Cannaregio, in an apartment called Nati’s place, although the apartment was basic it suited our needs, the bed was so comfortable, there was plenty of very good restaurants on the doorstep. Venice is spotless and I can’t wait to go back. Clean and comfortable and just what we wanted. Very near tourist areas but on a quiet residential canal/street. Lovely to sit on balcony and watch the goings on, especially the old little lady a few doors up who was a character. The bed is very comfy - not the sofa bed in the previous reviews, which has been replaced with a proper bed. There's heating too. The furniture in the bedroom is beautiful wood antique pieces and there are great paintings and arty stuff. It's not pretentious but it is cool. Little things like the crockery being so interesting - you kind of have to see it to understand. The photos don't do the flat justice at all. Small but not at all cramped. We weren't bothered by anyone. We really enjoyed it and would recommend it. My wife and I had a wonderful time during our 3 days in Venice, it truely is a magical city. If you go, don’t shortchange yourself on time there, it deserves more that a couple of days. We stayed at Nati’s House, which is located in the Cannaregio district, also historically known as the Jewish Ghetto. For us it was the perfect location, close enough to the train station, making the walk there pretty easy. It was also a 2 minute walk to the vaporetto (like a city bus, but on the water) so you can ride on the canals to get everywhere. But it is also just far enough away from the hub bub of the town to give you some peace and quiet. It seemed that there were mostly local Italian residents living there instead of tourists, and we really liked that. But when we wanted to get back to where the action was, it was only a 5 minute walk. The flat is on a quiet canal which can be viewed from a cute tile balcony, just big enough for 2 chairs. There are also 2 windows in the bedroom which face the canal. The flat is small, but efficient, it consists of three rooms, one room is a Kitchen with a small dining table and comfortable couch. It has all the necessary kitchen appliances and cooking/dining stuff. It also has a problem in that there are 2 old thick rugs on the floor that overlap by about a foot, the overlap is smack in the middle of the small trafic area, it’s extremely easy to catch a toe on the carpet as it doesn’t lay flat. It was annoying to us and could be a hazard for others, it should be replaced. The couch pulls out to make a bed but I really dont see more that 2 people living comfortably in this unit. The bathroom is small but decent. We really liked the towel heater on the wall. The bedroom is large, with good storage space for clothes, a desk and a couch which opens to a bed. The bed is the big issue at this rental. Evidently the owner feels that the bedroom can purpose itself as a bedroom, as well as a living room, so a sofa bed makes sense to him. To pull that off, you need to have a sofa that can make up into a decent bed and in this case it doesn’t. I don’t know how old this sofa/bed is but it’s well past it’s prime. It is the worst bed I have ever tried to sleep in, it’s comical really. Even taking the mattress off the bed and laying it on the floor is challenging, as the mattress is so old and has springs that poke you, but it’s the only option. If the owner were to install a proper bed in the unit I could recommend it. Dear Guest, I'm sorry if your stay in my apartment was not optimal. I wanted to inform you that, thanks also to reviews like yours, I have renewed most of the furnishings of the apartment and now there is a comfortable double bed with orthopedic mattresses. There is a new TV and several furniture that were not there before. Rugs have been replaced. You can see the new furnishing arrangement in the new photographs I have published. Great location, Paolo’s directions and restaurant recommendations were easy to follow & helpful. The apartment was spotless, enjoyed having our morning coffee on the Venetian terrace. You can't beat the location of this apartment. It's perfect for staying away from the craziness around San Marco and actually enjoying all the little canals and great restaurants in Cannaregio. The apartment itself is just okay. It's functional, but not the best we've stayed at. The pull out couch is really uncomfortable to sleep on. We're both young and our backs hurt! It could do with some sprucing up and a real bed. Located in the Cannaregio District, where the popular culture of Venice is still alive and where restaurants and “osterias” are still for Venetians (and for the few lucky tourists who go off the beaten track for a minute or two) .4-8 minutes walk from the boat service, 11-13 from railway station and 10 from Rialto, maybe less with “gondola” shuttle. If you plan to arrive to the San Marco Airport, just take the Alilaguna shuttle boat Airport-Venice, stop at Guglie water bus stop in Venice and then you have to walk four minutes and just one bridge to cross! Unless otherwise agreed (e.g. : posting of the keys), we accept guests at the property between 15:30 and 17:30. We are anyway quite elastic but in all cases, guests shall necessarily agree in advance (at least three days) an estimated arrival time. Lacking this agreement, check in time (15:30 and 17:30) must be respected. The client agrees to reimburse any consequential expense to give him acceptance after a wait exceeding the first two hours after agreed arrival time. See our Terms and Conditions pages for more info. Salvo diverso accordo (ad es. : l’invio delle chiavi), accettiamo gli ospiti tra le 15:30 e le 17:30. Siamo comunque abbastanza elastici ma in tutti i casi, gli ospiti devono concordare in anticipo (almeno tre giorni) un orario di arrivo stimato. In mancanza di ciò, il check-in (15:30 e 17:30) deve essere rispettato. Il cliente accetta di rimborsare qualsiasi spesa consequenziale per dargli l'accettazione con attese superiori alle prime due ore su quanto concordato. Più informazioni sul nostro contratto. A tourist tax (3 €/day per person computed only for the first week) is not included and will be due upon arrival. For guests' comfort, we can send a Paypal payment request (credit card payment on line) for the corresponding amount to pay. La tassa di soggiorno sarà dovuta al proprietario all'arrivo (o pagata da Paypal dopo la conferma della prenotazione) e solo per i primi sette giorni: € 3,00 a notte a persona. Non si applica ai bambini sotto i 10 anni. It’s our policy to maintain the same prices in all our advertisements. Prices in this website are lower than those shown in our private website. This reduction takes into account the fact you have to pay the Service Fee to book through this website. Manteniamo gli stessi prezzi in tutti gli annunci pubblicitari. I prezzi in questo sito sono inferiori a quelli mostrati nel nostro sito web privato. Questa riduzione tiene conto della tariffa del servizio per prenotare attraverso questo sito web.